The video game culture is no longer about staying up all night playing games alone. In fact, this is a major misconception of what it means to be a gamer. This definition is the most basic bare bones description of what it means to be a gamer; it’s reminiscent of your parents and grandparents saying, “it’s just a game”. The truth is, it’s never just a game. It’s a form of art. It’s a technical holy grail, created by skilled programmers that pour their heart and soul into developing a smooth playing, glitch-free, creative world. To me, gaming is about the shared experience, the connection to your friends near and far. I play video games to share experiences with my friends who live far away. We can play sitting right next to each other or we can play together even when we’re in different time zones. 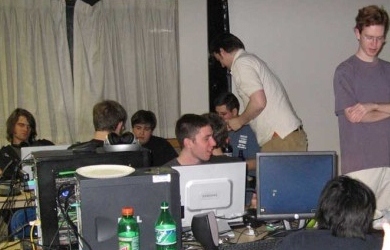 My favorite is when we have a LAN party with friends located in the same room and others located far away, all playing the same game, at the same time, collaboratively. I play co-op games because I love working with teams to accomplish goals and I get a thrill from a virtual fist-bump. I may be a newbie player compared to my friends, but they never leave me behind. They share in my excitement when I get my first kill and they watch my back as my health declines, often warning me to get out before I get killed. I also play battle and first person shooter games to relieve stress. I can rage out, curse like a sailor, and destroy things without the social repercussions– well, sometimes I get laughed at by friends who don’t usually hear me swear. I play world-building games, like Minecraft, to stimulate my curiosity and creativity. I envision structures and landscapes and make them in the game. I plant crops, hunt, and fish to survive. I build fences to prevent creepers from attacking me. Gaming is good, it’s an active activity (unlike passive television watching) that encourages teamwork, collaboration, and creativity. Games I’m currently obsessed about: Minecraft, Team Fortress 2, League of Legends, Words with Friends, NBA Jam, Orcs Must Die 2, NBA 2K13, Super Monkey Ball (Monkey Flight). Posted on January 2, 2014, in Communication, Tausend Talks Shop and tagged gaming, LAN, Video Games. Bookmark the permalink. 1 Comment. Pingback: Not Just a Game By: Julie Tausend | G33king Out | Embrace the geek.